These were a HUGE hit in my Kids Cooking Class last week! 1. Put Rice Krispies into a large bowl. Spray a 9x13" pan with non-stick spray, set aside. 2. Have the kids crush the Oreo Cookies in a plastic Ziplock bag. 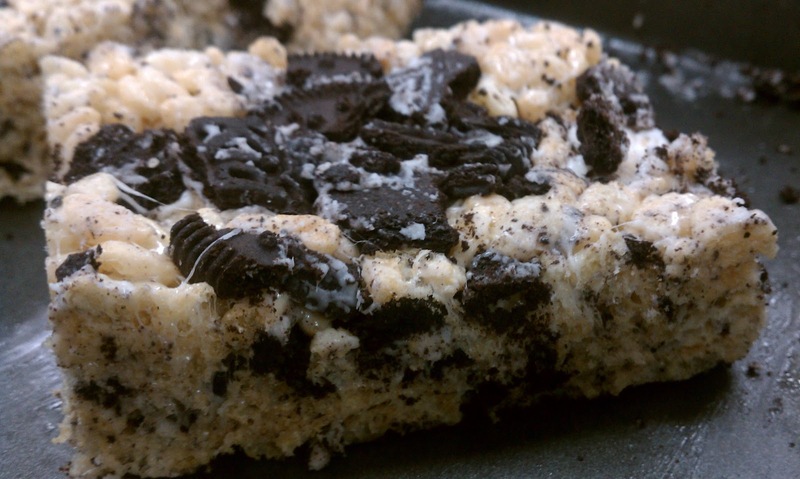 Add oreos to Rice Krispies and stir to combine. 3. Melt Marshmallows and Butter together on Stove top and continuously stir until melted. 4. Pour melted marshmallows over cereal and Oreo's and use a spatula sprayed with non-stick cooking spray to quickly combine all the ingredients. As soon as all the cereal is combined, spread mixture into the prepared 9x13" dish. Use the spatula or wax paper to press and flatten the mixture in the dish. 5. Allow to cool (about 20 minutes) before cutting into squares. Eat and enjoy! I found the recipe On Glorious Treats!